Uric acid results from the breakdown of compounds known as purines in the body. Purines are both produced in the body and consumed through the diet. Normal values of uric acid in the blood range from 2.4 to 6.0 milligrams per deciliter for females and 3.4 to 7.0 milligrams per deciliter for males. Uric acid levels higher than 7.0 milligrams per deciliter in the blood can cause crystals to form and build up around joints, resulting in a painful form of arthritis known as gout. Many foods contain high levels of purines, and eating these foods can lead to high levels of uric acid in the blood. One of the main sources of uric acid in the diet is red meat. Organ meats such as liver contain the highest levels of uric acid. Other red meats that contain significant amounts of uric acid include beef, lamb, veal and pork. 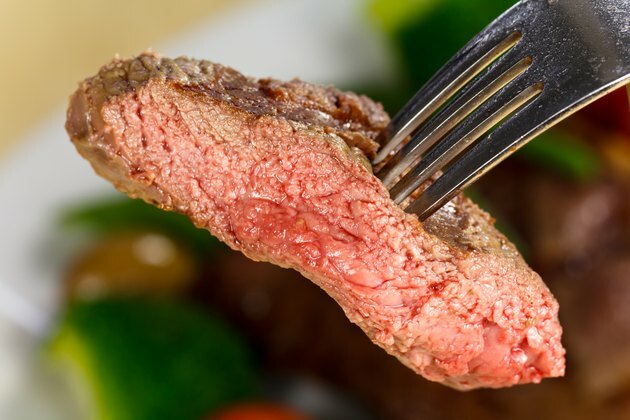 A 2004 study from the "New England Journal of Medicine" found a 21 percent increased risk of developing gout in men over the age of 40 for each additional serving of purine-rich red meat consumed. If you have been diagnosed with gout or have high uric acid levels, these meats should be avoided or at least limited to 4 to 6 ounces per day. Seafood and fish are other major sources of uric acid in the diet. Fatty fish such as tuna, mackerel, herring and anchovies, as well as lobster, scallops and shrimp, all contain significant levels of uric acid. The 2004 "New England Journal of Medicine" study also found a 7 percent increased risk of gout in men over the age of 40 with each additional serving of purine-rich seafood consumed per week. Along with red meats, these types of fish and seafood should be avoided or limited if you have high levels of uric acid in the blood or are prone to developing gout. Certain vegetables can contribute to higher levels of uric acid. These include spinach, asparagus, lentils, mushrooms and dried peas. Replace these vegetables with ones containing higher levels of magnesium and lower levels of calcium to help decrease the amount of uric acid buildup in the blood and decrease the chances of developing gout. The vegetables high in magnesium include corn, potatoes and avocados. Alcohol, especially beer, is important to consider in regard to high levels of uric acid. While they do not contain purines or uric acid themselves, beer and other alcoholic drinks increase the production of purines in the body. Avoid beer and spirits, such as hard liquors, as they have been shown to increase the risk for developing gout. Wine has not been shown to have any influence on gout development. It is best to limit all alcohol consumption to two or fewer servings per day.